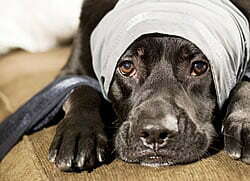 Many families in Britain have dogs, but lots are not too keen on the idea of dog insurance. It is believed that this may be due to the lack of understanding about and knowledge just how important dog insurance can be, and they feel that there is no real need for it. The reason people do take out dog insurance is prevent excessive veterinary fees and other expenses that can be incurred if your dog becomes ill or has a life threatening disease. Do you own one of Britain’s most expensive dog breeds? Insurance is a part of life nowadays and it can seem sometimes that it is necessary to make payments each month to insure against the most unlikely of events relating to things such as mobile phones, cars, household possessions and our housing itself. Why do dogs swallow non-food items? A recent survey by M&S insurance found that half of vets questioned claimed in the last five years to have had to put pets to sleep due to the owner being unable to afford treatment. Balancing the household budget can be tough at any time but the current economic climate has forced more and more people to scrutinise their outgoings with a magnifying glass in an attempt to find reductions. Is dog insurance worth getting? If you have a dog, the last thing you want is for him or her to become injured or unwell. However, the worst thing you can do sometimes is to ignore the possibility, as you may be put into a situation where you cannot afford the vet bills. Dog insurance can be as confusing as any other type of insurance, and there are many things that can increase your payments or mean you are not covered – and it is essential you know what these are to avoid heartbreak in the future. A couple are facing massive vet’s fees in order to save their dog, which had plunged over a cliff. Roxanne Peggie, 23, and Barry Blyther, 43, had taken their German pointer Rover to Northern Ireland. On parking their car at Limavady, a cliff whose name means ‘dog’s leap’ in Gaelic, Rover broke free and jumped over a wall at the cliff’s edge. It seemed almost humorous at the time – when I’m A Celebrity… host Ant McPartlin bent to greet a four-legged act that had appeared on Britain’s Got Talent, the mutt reacted like a rabid Gillian McKeith and sunk its teeth into him. Fortunately the animal was presumably less talented at biting than McKeith, and McPartlin needed no treatment, but the same cannot be said for many other people in the UK who are bitten by a dog. Website Patient UK reports 200,000 bites per year, with approximately 28,000 suffering bites to the face and 19,000 of those requiring plastic surgery. In fact, according to the site 100 dog bite victims are admitted to hospital weekly in the UK. 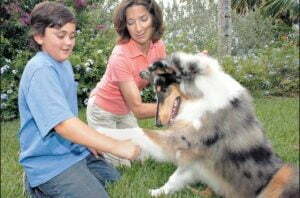 Caring for your dog not only requires an emotional investment – it also means that time and money is required. As well as buying your puppy from a reputable dog breeder, or donating money to a rescue home (if that’s where you got him), you will no doubt have bought toys, a dog basket and a dog collar. The issue of whether to purchase dog insurance may be one to make you pause for thought however. If a family dog becomes ill and passes away, everyone is bound to grieve at the loss, but for a child it can be more dramatic. 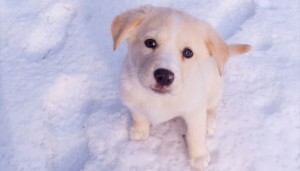 Some children may feel guilty as a mix of emotions rise up; in their mind it may be that they think they are to blame for the loss of the dog in some way. The one worry that arises from the loss of a dog in a child’s mind is what happens to a dog, will they be in heaven and will they see them again some day. As any dog owner will tell you, it’s important to have an adequate pet insurance policy. Dogs can get into all sorts of strife, and without comprehensive dog insurance you could be landed with an out of control bill from your vets. However, there are some things that you wouldn’t think a pet insurance policy would cover – such as if your dog became ill after eating an entire beehive full of bees. That’s just what happened recently to a dog in America, obviously. Ellie, a Labrador, recently ate an entire beehive full of dead bees, and the pesticides that killed them. Naturally, after eating this strange lunch she became very ill and required veterinary care, but thankfully was fine after a few weeks. In true American style, Ellie has been awarded the official prize of the most unusual pet insurance claim in America, given out by the Veterinary Pet Insurance Co (VPI).